Larry Ellison (Lawrence Ellison), who co-founded the enterprise software giant Oracle, and currently is a chief executive officer there, was born August 17, 1944, in the Bronx, New York. After being adopted as an infant by Jewish parents, he spent his high school years in the Chicago area. Larry himself did not subscribe to any religion, avoiding a bar mitzvah when he turned 13. He attended the University of Illinois at Urbana-Champaign for a few years then attended the University of Chicago, where he grew interested in computer design, but soon dropped out. Then at age 20, he moved to Berkeley, California in 1964. For his first eight years in Berkeley, Ellison worked for several different employers including Fireman’s Fund and Wells Fargo. He began doing computer programming work in the 1970s at Amdahl Corporation, where he helped build a mainframe system. He then moved on to Ampex Corporation before co-founding his own software company with two partners, Robert Miner and Ed Oates, called Software Development Lab in 1977. By this time CEO, Ellison had become interested in Structured Query Language after reading a paper by Edgar F. Codd called “A Relational Model of Data for Large Shared Data Banks.” The company changed its name a few years later to Relational Software, Inc. The software company’s first big client was the Central Intelligence Agency, who signed a two-year contract with Ellison’s team to build a relational database management system. This project, created in just one year, was called Oracle. In 1981 IBM contracted with Relational Software to use the Oracle database software for its mainframe systems, which put Ellison’s company on the path to robust, growing sales. In 1986 the company went public under the name Oracle Corporation, as $31.5 million was raised in the initial public offering. Oracle’s success temporarily dried up in 1990 when it posted its first negative earnings report, which hammered the stock, pointing the company toward possible bankruptcy. But Ellison radically reorganized the staff as he shifted his focus on product development and hired more seasoned managers. The changes paid off in 1992 when the company released Oracle 7, which made the company the leading developer of database management software, restoring Oracle’s stock price. Despite the company’s rebound, Ellison faced several physical injuries throughout the decade involving his participation in outdoor sporting activities, such as yacht racing, body surfing, and mountain bike riding. He won a major Australian yacht race in 1998 from Sydney to Hobart, surviving a hurricane that killed six contestants. During this time Oracle’s profile rose as their software began attracting huge clients such as banks, automakers, airlines and national retailers. By the end of the decade, Oracle had established itself as the premier online business applications provider. The company had a banner year in 2000 as their net profits skyrocketed by 76 percent with the rising demand for e-commerce solutions. By this time Ellison’s fortune was approaching the world’s richest man, Bill Gates. Oracle stood out as a survivor of the early 2000s recession that wiped out many tech companies. Starting in 2004 Oracle began buying a string of tech companies such as PeopleSoft, Siebel Systems and Sun Microsystems to expand market share. Other acquisitions included Agile, ATG, Endeca, [email protected], Hyperion, and Primavera. The company umbrella blossomed to include industrial manufacturing, engineering, and construction, financial services, health services, servers, storage, networking, middle-ware, insurance, utilities, retail, applications and more. 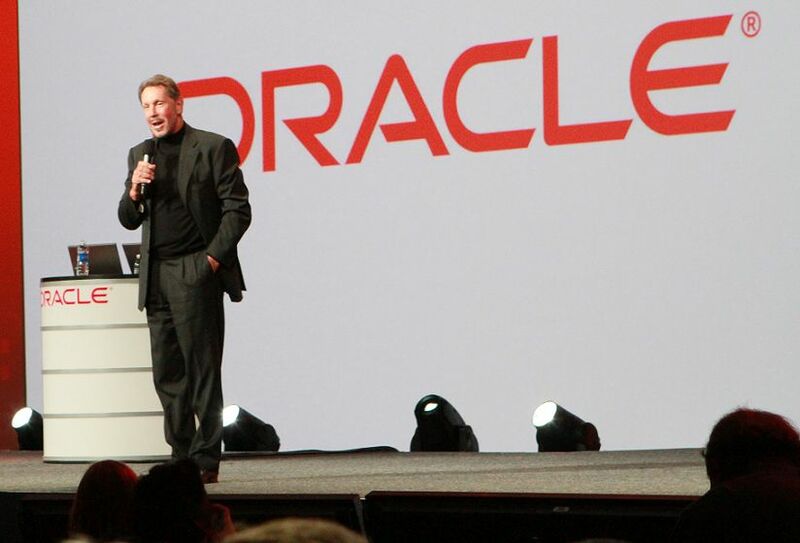 By the end of the decade, Oracle provided software for the entire Fortune Global 100. Throughout 2011 Oracle began acquiring cloud computing services, which was ironic since Ellison had made statements in the past to the effect he did not take cloud computing seriously. By 2012 the company had 120,000 employees and was one of the top software companies in the world with a market capitalization of over $150 billion, according to Yahoo! Finance. In 2012 Larry Ellison ranked as the third richest person in America, according to Forbes, with a wealth of about $41 billion. He married four times between 1967 and 2010 and has two children. He was a close friend of the late Steve Jobs. Ellison is a collector of expensive cars and airplanes. In 2010 he achieved a goal of winning an American Cup yacht race. He once owned one of the world’s biggest yachts called The Rising Sun, which spans 454 feet, housing a movie theater, basketball court and wine cellar. He sold the yacht to music industry billionaire David Geffen. One of Ellison’s most stunning personal achievements was he purchased the Hawaiian island Lanai in 2012 from Dole Foods billionaire David Murdock.